The multi-dimensional qualities of the tanzanite rings here at Diamond Boutique produce a unique shimmering hue that makes them a popular engagement choice. Found only in mines at Mount Kilimanjaro in Tanzania, the exclusively coloured Tanzanite is a deep blue-purple colour that changes with the light. Beautiful in any setting, tanzanite is a particularly popular choice for rings but equally as stunning as solitaire earrings. 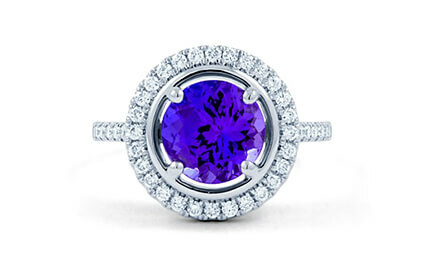 Find your perfect tanzanite ring in our collection today. Many of the unique designs offer free engraving, contact us today on ++44 (0) 203 6959 885 if you need any help or have a special request.